Classical, practical, good: the basic vertical model with the simple cable guide. 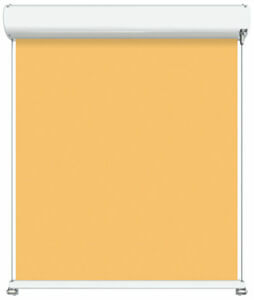 A simple – and proven – principle for providing cool shade and comforting light. 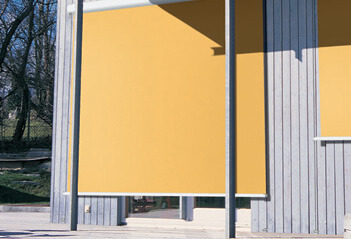 The blind protects not only from excessive heat, but also from prying eyes. For long lasting beauty: the awning is powder coated. The panel joints of the awning cover are ultrasonically bonded – the appearance is better without the bothersome stitiching. The reliable awning with a large number of configuration possiblities. Attractive front profile made of extruded aluminium with integrated gutter and water drainage spouts. Thanks to this innovative technical solution – tiered arms – narrow awnings still allow large extensions to be achieved. The 85 mm roller tube ensures the highest rigidity and the best possible cover winding characteristics even at the largest widths. Folding arms with perfected power transference by means of a rounded steel-link chain. In the case of manual operation ease of use is ensured with the spring assisted gearbox. Standard motor drive (optionally with automatic controls) for simple, relaxed operation. Radio-controlled motor with handheld transmitter for ease of operation – and ergonomically crafted for ease of use. The shadeplus creates an additional room on the patio. Protection from the sun, the wind and inquisitive glances all in one. An easily connected radio-controlled sun and wind sensor guarantees comfort and protection even during your absence. Every single markilux is a first-class product, and behind it lies a great deal of technical skill.Here you will find some of the most important technical details, which will make your decision a little easier.